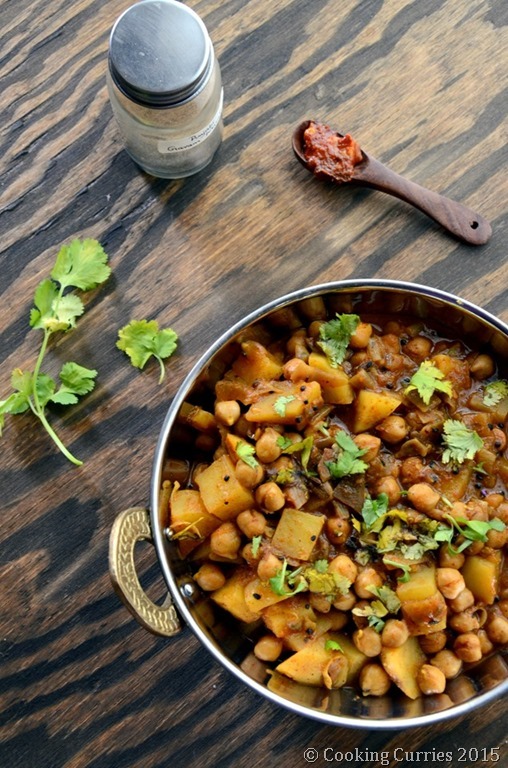 Tangy and spicy Potato and Chickpea Curry with the added flavor of Indian style pickle / achar. 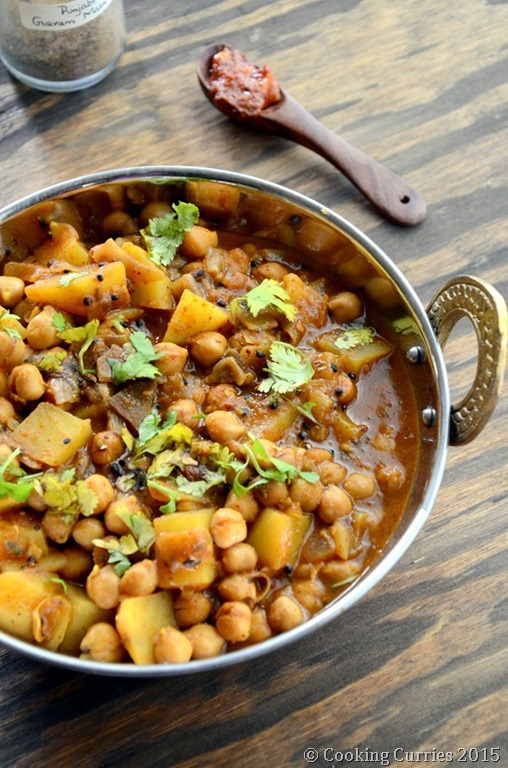 A perfect curry combo for rice or rotis. It is not the first time I am writing about this and definitely will not be the last time – because that is how most of my cooking sessions end up being. I started making a Achari Chana Pulao, a Tarla Dalal recipe that I have made several times before and at the last minute, I decided to make it a curry and not a pulao, which is a rice based dish. It is just that sometimes when you are cooking, you just don’t want to stick tot eh recipe. Especially if it is not yours. You have to put your mark on it. Other than the fact that you cooked it with the recipe. It is just some sort of weird compulsion I have sometimes. It need not always be a very drastic change, something subtle, something small is often enough for me. How the potatoes became a part of this is a whole different story altogether. I had just bought some sea salt after using regular salt for a very long time and as you all know, the saltiness of both are different. I added a little more of the seasalt and the achari chole masala became a salty achari chole masala. The recipe calls for adding some mango pickle to get that achari (pickle-ey) taste and I totally missed that the pickle has a lot of salt in itself. So, basically to rescue myself from the disaster, I added some potatoes to the mix. It worked like it was supposed to. Took away the saltiness and an added bonus was a totally new curry altogether. Now, this is what I love about cooking! Heat the oil in a heavy bottomed pan on medium-high heat. Add the mustard seeds, once they splutter, add the fonion seeds, cardamom pods, cumin seeds, fennel seeds and asafetida. Once they turn light brown and the seeds crackle, add the fenugreek seeds. Fenugreek seeds turn very bitter if they get burnt, that is why it is added at the very end. Now toss the onions and the ginger garlic paste to the spice mix and saute till onions are translucent. Add the turmeric powder, chilli powder, Punjabi garam masala and salt and saute well. Now add the mango pickle, the garbanzo beans and the potatoes. Add a little water and mash some of the potatoes and garbanzo beans so that it thickens the sauce. Cook on low-medium heat for 5 minutes or so. 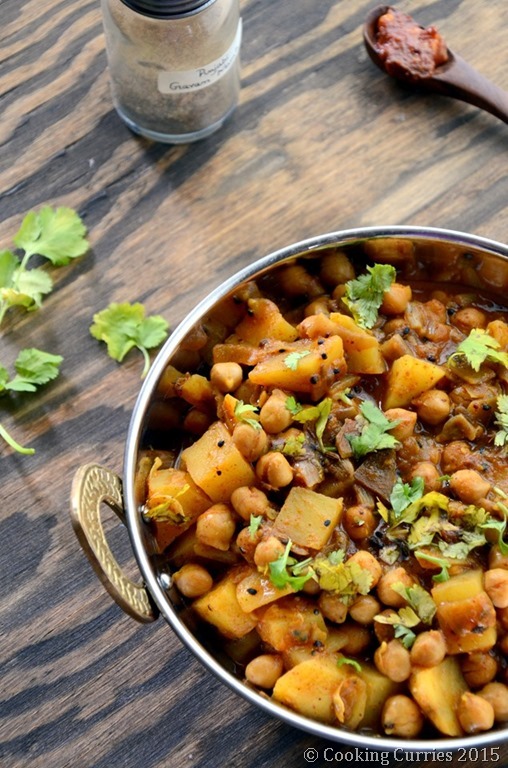 Garnish with chopped cilantro and serve with basmati rice, chapatis or naan. If you want to use dried beans instead of canned ones - soak 1/2 cup dried garbanzo beans overnight and cook well till easily mushed. 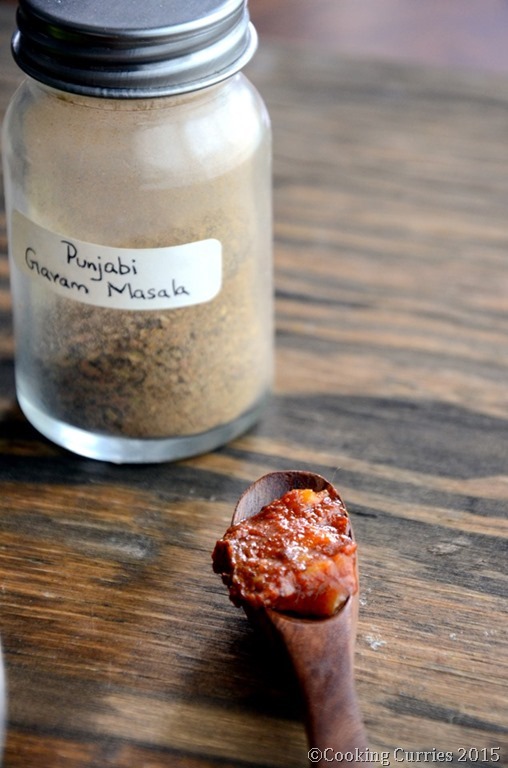 Recipe for Punjabi Garam Masala. Or you can use regular garam masala if that is all you have. 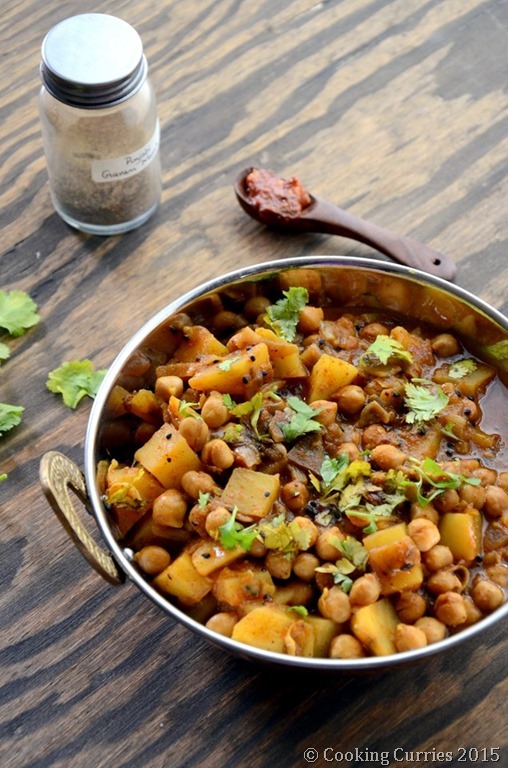 good recipes, Achari Aloo Chole is very Delicious. I like this. Thanks. This was an out of the park home run! I was out of hing so I used amchur powder instead and added 2 tej patta. It disappeared before before I could make round two of chapatis! I will be doubling it next time!